Take stock of shared service options and benefits to increase citizen customer service efficiencies. These facts and proof points will help. Sharing technology services – like any other sharing strategy – helps to relieve the heavy financial and administrative burden on individual agencies and departments. By adding their users to an existing IT service, such as email delivery, web hosting or help desk, these organizations can avoid or minimize the need to select, purchase, install, operate, support and maintain their own hardware and software. Even more compelling, sharing services can give smaller agencies and programs access to leading IT solutions that would be too expensive or too complex to acquire and administer themselves. Geographic information systems (GIS) require sophisticated technology and data gathering plus specialized staffs, and so GIS presents a special opportunity for sharing. This is especially true for counties and their municipal governments, since their GIS maps cover the same territory. An example of a collaborative GIS function is in Hall County, FL (pop. 186,000), which collaborates for GIS use with the City of Gainesville, GA (pop. 35,000), the City of Flowery Branch (pop. 6,000), and the City of Oakwood (pop. 4,000). At the Federal level, shared services began in the 1980s with interagency cross-servicing initiatives, such as payroll and the consolidation of administration services. Around 2000, a concept called Lines of Business looked at sharing common business functions including financial management, human resources, grants management and infrastructure. In 2012, the Obama administration released its Federal IT Shared Services Strategy, which provided guidance on implementing shared services to help reduce waste and redundancy. One example is the Office of Management and Budget’s Invoice Processing Program, shared by 16 Federal departments. As of March 2016, more than 100,000 government contractors were getting paid through this shared platform. Among State CIOs, shared services is second only to cybersecurity in importance, according to a 2016 survey conducted by the Center for Digital Government. States are sharing services internally and externally. Sharing the interactive voice response (IVR) system used by many Federal, State and Local contact centers for voice self-service can be a winning strategy. Unlike specialized applications used only by specific agencies or departments, an IVR is a horizontal system used across contact centers, which makes it a logical choice for sharing. An IVR platform can handle self-service inquiries and transactions for a wide range of government functions, from benefits programs like SNAP to probation management by Departments of Correction, for example. The most advanced IVRs are adaptive, cloud-based platforms that leverage a robust business intelligence framework to create highly personalized experiences for callers. In turn, these satisfying citizen self-service experiences help to minimize the need for costly live agents. By sharing an IVR service with other agencies’ hosted contact centers, governments can provide valuable benefits to their IT team, program administrators and the organization as a whole. Avoiding risk: By adding more users to an established and proven IVR service, governments can be confident that the system will deliver the features and performance they require. In contrast, it can be risky to evaluate and implement a new IVR platform – make sure it can manage load, is scalable and secure. Accessing the best technology: Smaller government entities can access best-of-breed IVR technology by sharing services. On their own, they may only be able to maintain an ineffective system that doesn’t do the job. Saving money: Economies of scale kick in when governments share an IVR platform. 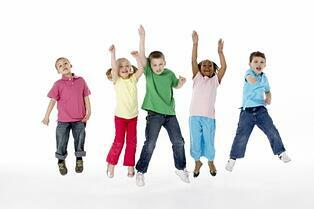 Also, a shared service means one central IT team can support users across many agencies and entities. This approach helps make the most of limited IT budgets. Reducing complexity: A government agency or program wishing to use an IVR can avoid the time and effort of issuing a request for proposal (RFP), evaluating candidates and implementing the chosen solution. Instead, the existing IVR contract can easily be amended to include additional entities, which are differentiated from other participants with data partitions, customizations and separate billing. 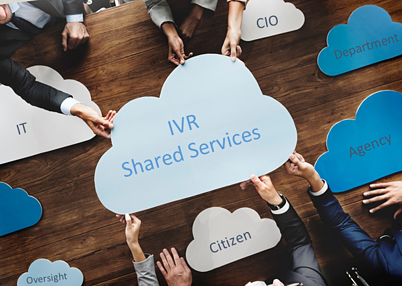 Enabling cloud and IES: Shared IVR services help to promote adoption of cloud hosting and integrated eligibility systems (IES) for health and human services programs. Leading IVR platforms, such as Contact Solutions’ Adaptive IVR, are hosted in the cloud, which dovetails with the general move toward delivering applications as a cloud service instead of installing and administering them in the local datacenter. A shared IVR service also aids in the establishment of IES by providing a centralized voice self-service function across multiple eligibility programs such as Medicaid, SNAP, TANF and unemployment benefits – managing beneficiary data without intensive internal integration challenges. For instance, to simplify constituent engagement with multiple human services benefit programs and increase worker efficiency, the State of Georgia launched a shared service hosted contact center option and an IES initiative to integrate disparate IVRs. Instead of calling into different program support lines separately, citizens can get information on eligibility and benefits for all relevant programs from a single access point. This project is expected to increase enrollment to optimize Federal funding, and give State employees a comprehensive view of each individual. The shared services concept is poised to gather momentum, as shown by the Analytical Perspectives report on the proposed 2017 Federal budget. The budget would provide financial support for shared services as a critical aspect of standardizing operations across agencies. Sharing your IVR system with more government groups and functions is an easy way to achieve a quick “win” in this critical area. 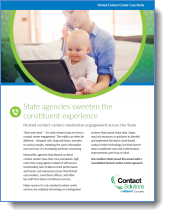 Read the State Hosted Contact Center case study to see IVR shared services in action.